Triumph Developments has moved forward with construction of phase one of Howard Park Condos, the 8 storey eastern tower. Now phase two will be coming soon to the market, its western counterpart. Howard Park Condos is located at 24 Howard Park Ave, near Roncesvalles Ave and Dundas St W.
The final phase of this master planned community in the heart of Roncesvalles Village, will have only 96 residences. Gas cooking is available to all residents, inside and outside – on oversized balconies and massive terraces. 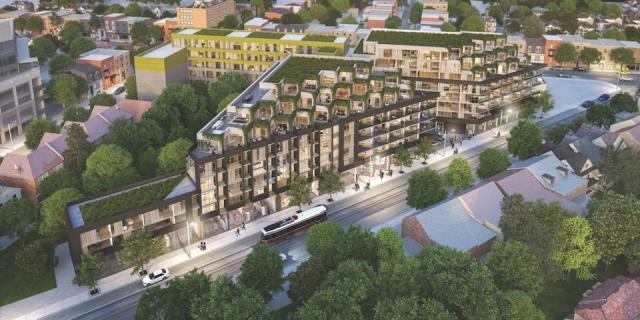 Phase two at Howard Park—named after the street it sits on which connects Dundas West to High Park—continues the clever RAW Design plan of phase one, created to take best advantage of the mostly triangular site. Suites on floors six, seven, and eight read as a series of cubes turned 45°, each provided with a private terrace with views to the city skyline, the lake, and High Park. While the balcony fronts of floors two through five run parallel to Howard Park Avenue, the eastern half these suites are also angled to catch skyscrapers on the horizon. Retail units will enliven the sidewalk at ground level. Howard Park Condos have been designed with the environment in mind with plenty of green features, and in fact Howard Park will use geothermal energy to heat and cool the complex. In-suite features include 9-foot ceilings, a complete package of high-end appliances, stone counter tops in the kitchen and bath as well as hardwood flooring. Howard Park Condos phase two will consist of 1 bedroom, 2 bedroom and 2 bedroom plus den designs.